You know that cupcake that's just too cute to eat? Or the candle that's far too pretty to burn? 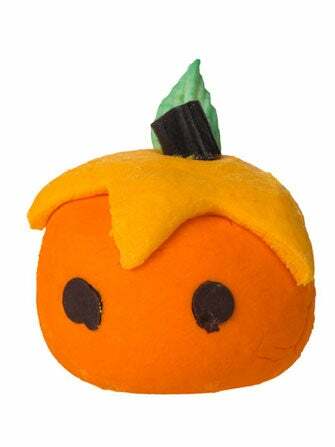 Well, that's kind of how we feel about this adorable, limited edition Halloween bubble bar from LUSH — this delightful, tiny pumpkin is so precious, we'd hate to see him dissolve in our tub. That being said, we eventually devoured the aforementioned cupcake — so, it's pretty safe to say that in the coming weeks, we'll be indulging in some decadent baths thanks to this cute little guy. Despite appearances, Lush's Pumkin Bubble Bar — and the rest of his equally playful pals — aren't your standard Halloween-themed body products: The Lord of Misrule Bath Bomb is layered with notes of spicy black pepper oil and soothing patchouli. We can picture ourselves lounging in the tub (with a seasonally appropriate cocktail in hand, of course) already. Lush Creatures of the Bath Pumkin Bubble Bar, $5.95, available at LUSH.